We knew that this keto macadamia brittle was destined to be a holiday season classic around here at first bite. It’s a taste combination that is pure magic — keto toffee, roasted macadamias, and ultra dark chocolate. The new status of “classic” in our house ultimately comes down to one thing — replay value. Like all of you, we are quite busy and try to work from our pantry rather than make unplanned one-off trips to the grocery store. 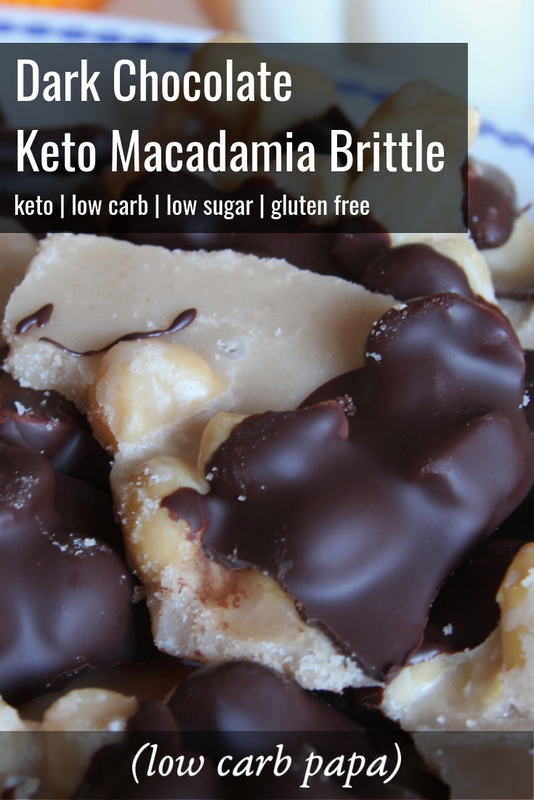 This Keto Macadamia Brittle uses only a few ingredients that we always have around — butter, erythritol, macadamias, vanilla, and super dark chocolate. 🍫 This makes it an easy one to reach for to make consistently year after year. This recipe’s simplicity also makes it incredibly kid-friendly, so it is fun for the whole family 👪 around the holidays. Our little ones love to watch the sweetener transform and caramelize. With appropriate supervision they can stir in the nuts and help to pour out the mix. Then the magical hardening occurs, after which they love breaking the brittle up and dipping it in dark chocolate. Like many of you who have confessed this to us on Low Carb Papa’s Facebook page, we are completely addicted to the Royal Hawaiian Salted Macadamia Nuts that are sold in our Costco off and on in the powder blue bags. I am being generous when I say “on and off”, as it has been mostly off recently. Their scarcity is probably the only thing preventing my from totally blowing my fat macro on them, so I suppose I should be somewhat thankful. As I dove into them on the way home, getting macadamia nut oil and salt all over my steering wheel, I thought a little about opportunities their size might present. They are almost the size of large peanuts 🥜, you know? So, peanuts. Peanuts, peanuts, peanuts. 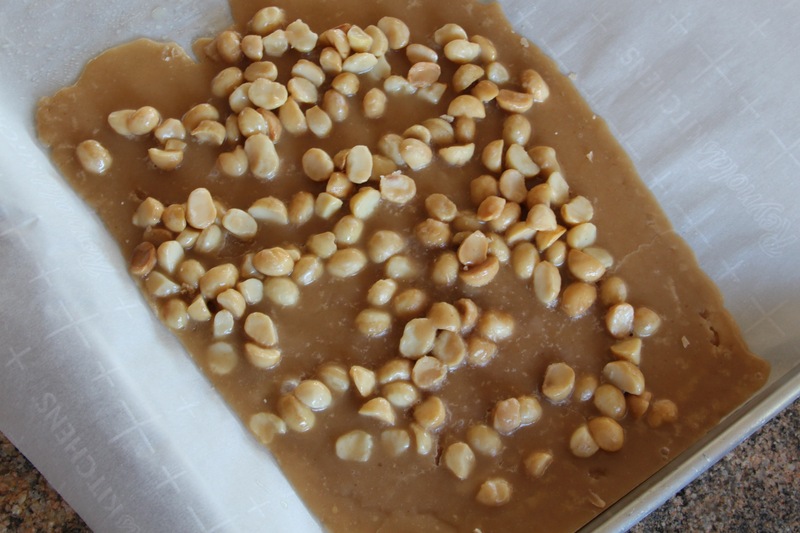 Peanut… brittle? Keto macadamia brittle? Dipped in dark chocolate, because why the hell not? 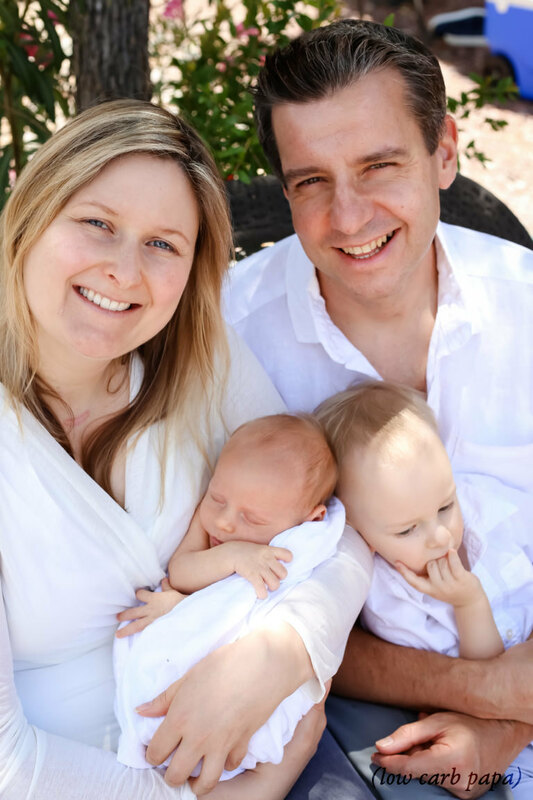 This Dark Chocolate Keto Macadamia Brittle post contains affiliate links, paying me a commission from purchases made through them, at no additional cost to you. We knew that this keto macadamia brittle was destined to be a classic around here at first bite. It's a taste combination that is pure holiday season magic -- keto toffee, roasted macadamias, and ultra dark chocolate. Chop the butter into small pieces and melt in a saucepan. Add the erythritol and bring to a boil, stirring to dissolve it completely. The simmering will slow as the water boils off and the mixture will thicken slightly and start to caramelize and smell amazing. If you are using a candy thermometer, which I recommend, the mixture will be a little over 300 degrees F. Remove from the heat at this point. Stir in the vanilla and the macadamias. Stir gently to let the mixture begin to cool and thicken a little. Cover the sheet pan with a piece of parchment paper and lubricate the surface lightly with avocado oil. Pour out the mixture onto the sheet pan and let cool completely. You can place it into the fridge to speed this process up. Once the mix is cool, break into approximately 16 pieces and set aside. Either using a microwave or a double boiler, melt the dark chocolate in a small bowl. Dip the pieces into the dark chocolate and place back on the parchment paper to cool completely. You can place it in the fridge again to speed things up. Serve. This recipe produces candy that lives up to its "brittle" moniker. It will not be as hard as its full sugar counterpart. I would not advise using a cooling rack for draining excess chocolate from the candy after dipping it in dark chocolate. It will be very difficult to remove from the rack when cool without destroying it. No Replies to "Dark Chocolate Keto Macadamia Brittle 🍫🍪"